Our latest market commentary includes our review of market performance during the second quarter of 2018. 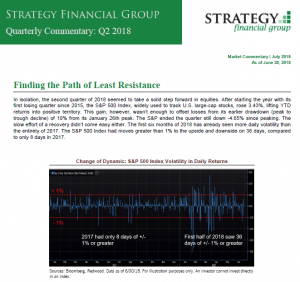 Click here to read our Quarterly Commentary: Q2 2018. To schedule a call with one of our advisors, contact us to request an appointment. *Guarantees provided by life insurance and annuities are backed by the claims-paying ability of the insurer. Strategy Financial Services, LLC may transact business only in states in which it is registered, or in which it is excluded or exempted from registration. Strategy Financial Services, LLC is currently registered in Arizona. Investment advice is offered through Strategy Financial Services, LLC, a Registered Investment Adviser. Insurance and annuity products are offered separately through Strategy Financial Insurance, LLC. The logos and trademarks used are the property of their respective owners and no endorsement by those owners of the producer is stated or implied.